"Contemporary reporters stumble into ancient powers - and modern urban fantasy gets a colonial Gothic twist. Blackwell's smartly original series is heady - and headless - good fun." 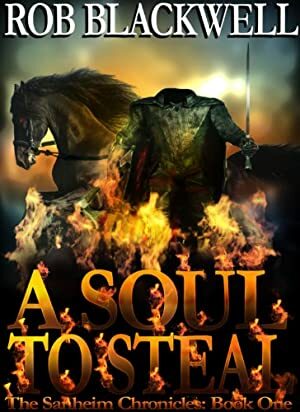 A Celtic legend and "The Legend of Sleepy Hollow" collide in A Soul to Steal, a bestselling Kindle novel that deftly combines urban fantasy, mystery, and suspense. years ago, has returned. Quinn and Kate, two community journalists, race to uncover his identity before a promised bloodbath on Halloween. But to stop him, they may unleash a far darker threat -- and pay an unimaginable price. A Soul to Steal has been featured on USA Today and praised by book bloggers and readers alike for its thrilling combination of urban fantasy, mystery and suspense. "With the combination of an ancient Celtic myth and the legend of the Headless Horseman, Blackwell's story is a leave-the-light-on kind of page turner... If you like suspenseful thrillers, check out A Soul to Steal." Book One, A Soul to Steal: Two reporters on the trail of a killer find much more than they bargained for. "When I first downloaded 'A Soul to Steal' I had no idea I would get sucked into a series that would fire my imagination and twist mythologies so thoroughly." Book Two: Band of Demons: Quinn and Kate confront a new evil that threatens to destroy their town. The novel has earned rave reviews for its "plot twists that will leave you gasping for air." Book Three: Give the Devil His Due: "A stellar conclusion to one of the best trilogies I've ever read... I'm still reeling from the ending." We started tracking this book on February 18, 2012. The price of this book has changed 53 times in the past 2,618 days. The current price of this book is $2.99 last checked 18 hours ago. The lowest price to date was FREE last reached on April 13, 2017. The highest price to date was $2.99 last reached on November 5, 2018. This book has been $2.99 23 times since we started tracking it. We last verified the price of this book about 18 hours ago. At that time, the price was $2.99. This price is subject to change. The price displayed on the Amazon.com website at the time of purchase is the price you will pay for this book. Please confirm the price before making any purchases.